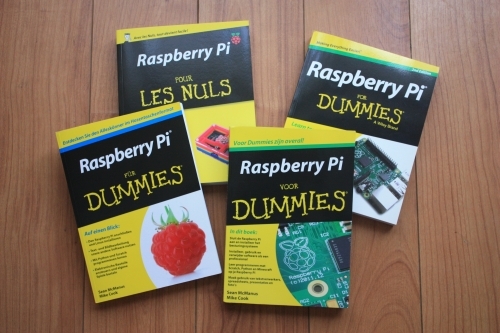 Sean McManus's Writing blog: Raspberry Pi Voor Dummies - Dutch edition just published! You are here: Home > Blog Home > Sean McManus's Writing blog: Raspberry Pi Voor Dummies - Dutch edition just published! Raspberry Pi Voor Dummies - Dutch edition just published! I was pleased to receive a surprise package this week that contained a copy of the new Dutch translation of Raspberry Pi For Dummies, 2nd Edition. As you might know, the updated book added new chapters on Sonic Pi, RISC OS and Minecraft (more details here). The Dutch edition (Raspberry Pi Voor Dummies) joins the French and German translations of the first edition (Raspberry Pi Pour Les Nuls and Raspberry Pi Fuer Dummies). It's great to know that the book is reaching readers in many different languages! You can find out more about Raspberry Pi For Dummies here, including bonus content. If you'd like to order a copy, I've added some useful ordering links in my shop, and a form you can print off if you prefer to support your local bookshop.